Our production team is, to put it simply, one of the best in India. In experience, attitude, commitment and, most important, performance. To the extent practicable, SHOFT ensures all steel material surfaces are maintained in SA 2-1/2 standard throughout the entire life cycle from procurement to final vessel completion. Steel plates are procured shop-blasted to SA 2-1/2 and primed and stored in vertically stacked configuration. Initial fabrication (plate and section cutting) is carried out mostly in covered fabrication bay. CNC plate cutting is normally used unless the hull shape is such that CNC is not warranted. 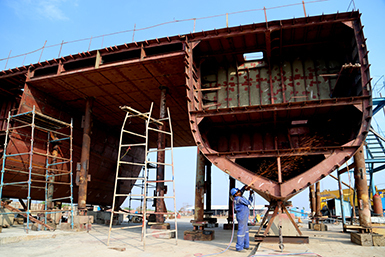 The hull of each project is divided into several blocks, each block is further sub-divided into several units and finally each unit is further sub-divided to panels. Trailer is used for shifting from North to South Yard for erection and alignment on the building berth. 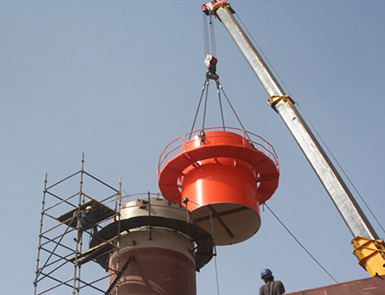 Weights up to 70t are easily handled; for higher weights we make special arrangements. Out of our three slipways, the largest one is reserved for on-slipway erection of over-dimensioned vessels; length more than 125m and up to 145m and/or beam more than 25m and up to 40m. Erection is never done directly on other two slipways. They are exclusively reserved for launching. The areas adjacent to these two slipways are concreted with adequate load bearing capacity and are used as building berths. These building berths are not fixed but assigned depending on sizes and mix of vessels under production at any point of time. This flexibility helps us accept orders for simultaneous production of several vessels. At a peak period we have handled up to 10 vessels of varying dimensions. We complete outfitting on the building berth to the maximum possible extent. The entire South Yard berth area is equipped with underground cabling and a network of electrical supply outlets. Outfitting departments like piping, electrical, HVAC, accommodation, engineering are provided with independent power points for carrying out their work efficiently. 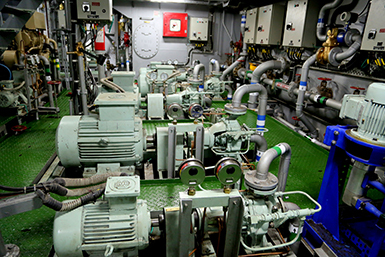 Before launching we complete essential underwater and other engineering, as much as possible and permissible - all auxiliaries, pumps, compressors, STPs, ROs, OBSs etc and, except for final end connections and all associated systems. Launchings are carried out on days of selected high tides, preferably in daylight hours. High tides are available generally at least 3/4 days in each month. 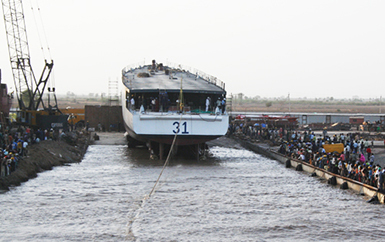 For launching, vessels (except for those erected on the largest slipway) are shifted from the building berth to the slipway on rails using a suitable configuration of pulleys and wire ropes activated by one or more winches located strategically to serve both slipways. Using a large number of hydraulic jacks, the vessel is positioned to the right inclination as pre-determined by launching calculation. The final launching is done with the use of cradles running on steel rails. Launching weight is not an issue. Shoft has launched vessels up to a lightweight of over 4500t. 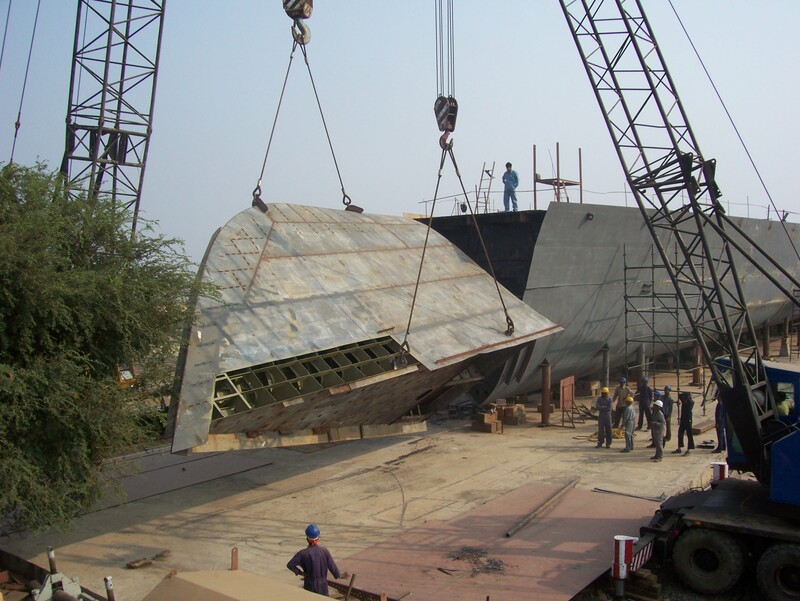 To allow for higher aft drafts, the slipways have been extended on the riverside and, currently, aft launching drafts up to 3.5m can be easily handled. There is provision for further extension for higher aft draft. Floating pontoons function as outfitting wharfs and are used for harbour tests and trials. The pontoons are connected to the shore with hinged, swiveling gangways to take care of tide variations and for easy round the clock access. The berthing pontoons stay afloat even in the lowest tide, which never goes below 7m. 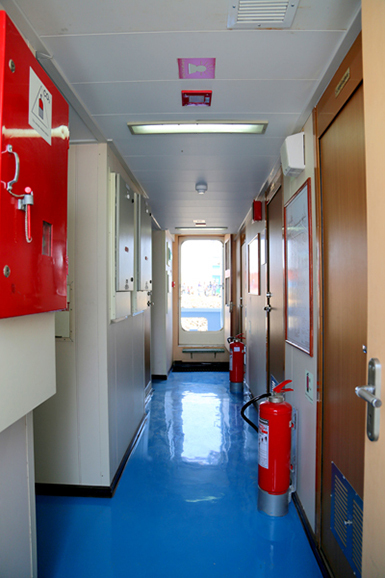 They are permanently provided with service connections - air, water, electricity and adequate safety arrangement, particularly for fire fighting. Vessels, after launching, always remain in afloat condition. There is no interruption in afloat tests and trials. 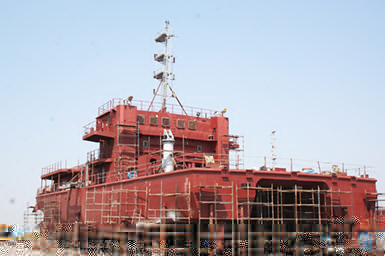 Sea trials, depending on requirements, are often carried out in front of the shipyard itself where the river is very wide and depth is adequate. 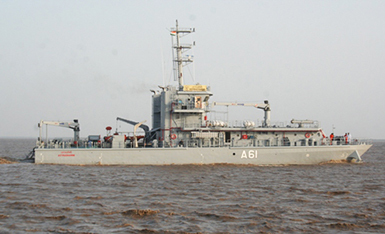 Otherwise trials are carried out in the Gulf of Khambatta where the river ends, about 10nm downstream from the shipyard. The channel is wide and navigable and is sufficiently deep except for one or two points. Normal high tides allow drafts up to 4.25m. For higher drafts some special high tides need to be selected.